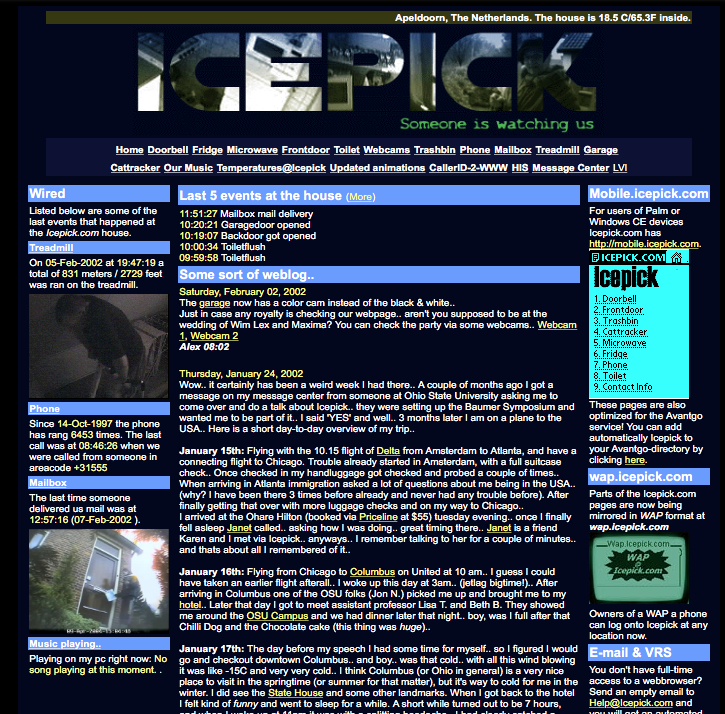 The story of Icepick.com starts in 1998 when I lived above a car dealership. I noticed when I was home that many people rang my doorbell asking about the cars that were for sale (while I had nothing to do with their business). I started to wonder if people also rang my doorbell when I was at work and so I came up with the idea to wire my doorbell to the computer and have a picture taken of the person ringing my doorbell. At the same time my cat had given birth to little kittens and I put a webcam on the nest of kittens and broadcasted both things on the internet. Both setups are quite regular now (a wired doorbell and a webcam on an animal) but back in 1998 it was groundbreaking. As my website visitor numbers started to grow I wired up more things in the house, the mailbox, the fridge and the toilet. At one point in time the website had 12 webcams showing an inside into my life. I had about 4000 unique visitors a day and back in those days that was quite a good number. In the period 1998 - 2001 I did numerous newspaper, radio and tv interviews and held speeches in Amsterdam and the USA. It was a fun and exciting time. As technology got more advanced so did the website. One of the technologies I knew would change things would be wireless technology. In the early days I had cables running from everything that was wired (so a cable ran from my toilet to the computer to measure the flushes). Using a homemade interface I could then record the flush. I kept on using this wired technology for a long time untill somewhere around 2012 I switched to a more wireless technology by using 433mhz COCO (Click on Click off) technology. Up to this day I still use COCO for some things in the house like the toilet, fridge, doors etc. The COCO technology is actually made for using together with lamps but using a RFXComm receiver I can also use it for different purposes. One major step forward was the introduction of Philips Hue. The Hue system has a major advantage over the older COCO system, it’s bi-directional and it had a well documented API for programming. The COCO system was always one way. If an event happens (let’s say the toilet flushes) the transmitter will send a signal to the receiver. No check is done if that signal was actually received. With hue the communication is much more advanced and also the network is mesh based meaning every item in your netwerk will extend the reach of the network. Running the website also had some challenges in the beginning. I started with 2 big desktop computers being on all the time. In the beginning I ran using windows and in 2000 I switched to Linux. Back in 2000 I was asked to set up some technology on big brother germany season 2 (a very popular reality show back in those days) and Linux was just a requirement for a stable working environment. So ever since 2000 I have been using linux. I started with RedHat linux. Somewhere around 2010 I swapped the 2 pc’s for 2 old windows based terminals from Fujitsu Siemens flashed with linux. They reduced the size from a desktop pc to the size of a book. A few years later I swapped those to a couple of Raspberries reducing the size once again to the size of a sigarette box. The raspberries have been flashed with a read-only SD card and they serve me very well. They handle all the sensors, Philips hue monitoring and dozens of other functions. In the 17 years I have been running the website I moved twice, and the last move was relative easy because of all the wireless technology. People sometimes ask me if I run software like Homeseer. From the beginning I have been running my own custom software. I programmed things from the ground up and this has always been working well for me. If you are new to home automation, I think Homeseer might be a good starter solution. My website has been hosted since 1998 at Dreamhost. When I started with them they were a relative small company. Now they have grown to a huge USA based webhoster and they have lost a little bit their touch with loyal customers. However, their pricing remains good for my purpose but I was eventually forced to pull my database hosting from them. It just got too slow (or my requirements outgrew them). To publish the data you see on the website I use simple SSI. Every little field you see on the website is an SSI element. Making websites was never my good quality. 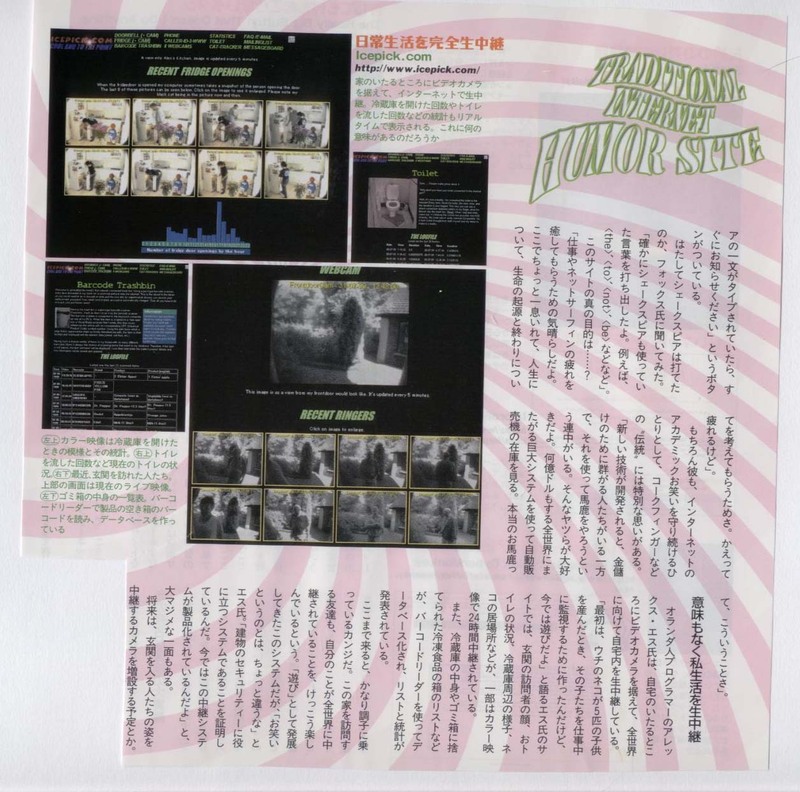 I always feel if my webdesign skills would have been better the data would have looked better and more understandable. Sorry guys! Currently I am still quite active with electronics, sensors and light technologies. I love my recently bought Nanoleaf Aurora and I have a whole army of Raspberries laying around to play and experiment. For sure the website changed over the last couple of years, the webcams are gone, some technologies come and went.. but Icepick.com’s heart is still beating strong. The Icebot was a Lego built remote controllable car with a webcam. Website visitors could move the icebot around the house. I guess it was a early 2000’s version of virtual reality. 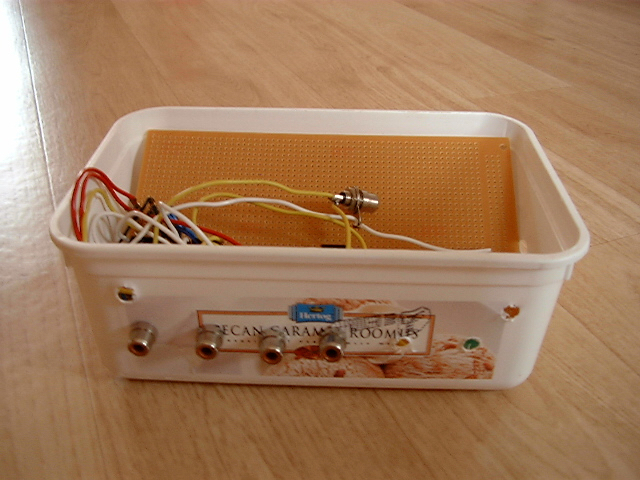 One of the very first homemade relay controlled camera switchers. I used this to connect multiple camera’s to one video card and switch all the time between the camera’s. The box is an old icecream box. 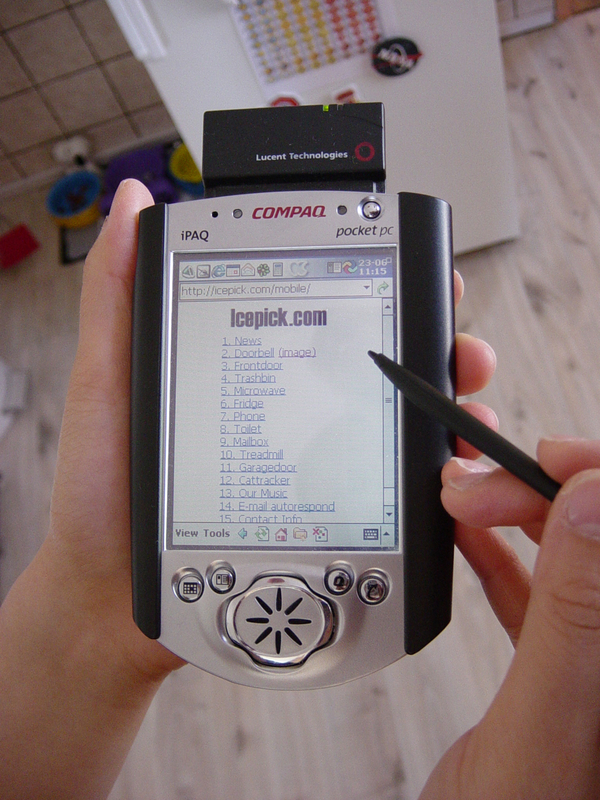 My first attempts in 2002 to make a mobile version of the website. 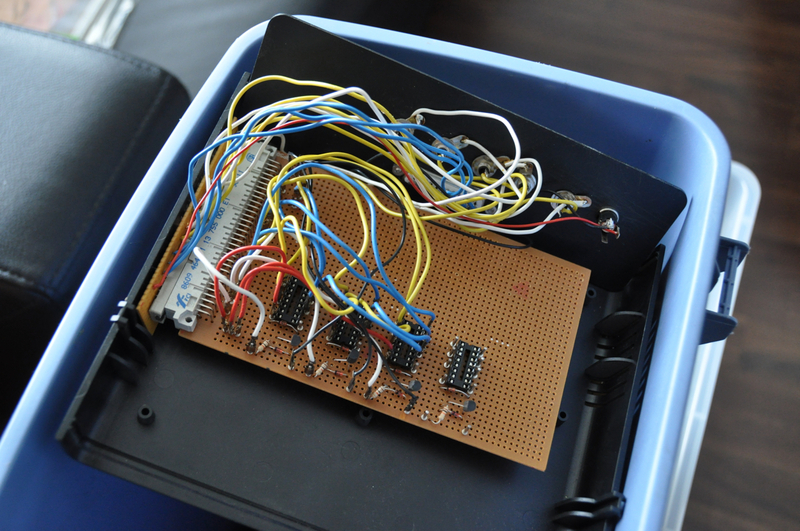 Homemade digital input to connect the devices in the house from 2010. 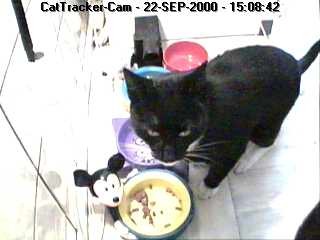 Image from the cattracker webcam from the early days.